Epic crowned the classical hierarchy of genres, in large part because of the prestige of its subject matter—the establishment and maintenance of divine and human order. In ancient Rome, epic’s significance begins with Ennius, who adaptated Greek dactylic hexameter into Latin, securing the genre’s primacy as a narrative vehicle for celebrating Roman achievements. From these beginnings Latin hexameter was refined in the poetry of Lucretius and Catullus; the form flourished in the hands of Vergil and his successors. 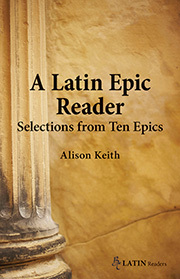 This edition offers twenty-seven selections from a rich corpus of ten Latin epic poets. Though the focus is on republican and Augustan epic, a sample of later imperial epic allows exploration of the full expanse of Rome's responses to her own history and political culture, and to the art, history, and literature of ancient Greece.